Come to experience the adventure and enjoy the beauty of wildlife. During this trip, you will completely immerse yourself in the breathtaking nature as well as explore animals and their habitats. Playing game drives in national parks, taking part in the crater tour, and camping in airy space will become parts of your wonderful memories through this holiday. Join Meru Slopes Tours and Safaris and you will know why this tour is worth it. Group size: max 6 pers. per pop up roof 4X4 vehicle. Group and private safari possible, rates will vary depending on this. During this tour, you will camp at Ngorongoro Simba campsite, Seronera Campsite, Sunbright Campsite and stay overnight at Arusha Tourist Inn for the night of the arriving day. The camping accommodation can be upgraded to lodge accommodation upon request for extra fees. Simba Campsite lies on the very rim of Ngorongoro Crater and has an excellent view across the caldera. A fantastic sunrise over the crater rim opposite makes a fine breakfast scene. Often there are elephants wandering around the camp! There is a possibility to upgrade the accommodation from campsite to lodge. Please make sure to send an inquiry in case you would like to make an upgrade. After the early breakfast, you will proceed for a full day game drive at Tarangire National Park with a picnic lunch. You will have your dinner and stay overnight at Tarangire campsite. The accommodation at the arriving day will be arranged by Meru Slopes Tours and Safaris for the extra cost. After the breakfast early in the morning, your drive guide will drive you from Tarangire to Serengeti National Park. You will set out for the endless open plains and stunning skies of the Serengeti. You will enjoy a good-looking four-hour drive, full day game drives together with late evening game drive. You will have your dinner and stay overnight at Seronera Campsite. In this day, you will move from Serengeti to Ngorongoro. After a relaxing morning and an early lunch, you will be doing game on the route while you are at Serengeti way to Ngorongoro and you will be at Ngorongoro late in the evening where the night will be spent on the crater rim. Dinner and overnight stay will be served at Ngorongoro Simba Campsite. After the early breakfast, you will proceed directly to the crater floor for a full day crater tour with picnic lunches down the crater whereby here you will be able to see all "big five" animals. Later, you will proceed back to Arusha in the evening. At the end of your tour, Meru Slopes Tours and Safaris will drop you off at the airport. During this tour, you will play game drives at Tarangire National Park and Serengeti National Park and visit Ngorongoro Crater for a full day crater tour. This safari will take place in Tarangire National Park, Serengeti National Park, and Ngorongoro Crater, Manyara Region, Tanzania. 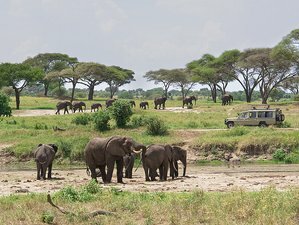 Tarangire National Park is the national park which herds of up to 300 elephants scrape the waterless riverbed for alternative streams, while nomadic wildebeest, zebra, buffalo, impala, gazelle, hartebeest, and eland mass the decrease lagoons. It is the most attentiveness of wildlife outside the Serengeti ecosystem, a smorgasbord for predators and the one place in Tanzania where dry-country antelope such as the stately fringe-eared oryx and peculiar long-necked gerenuk are regularly practical. The only national park that holds the migrant during the dry season and welcoming home of different species of animal. Daily breakfast, lunch, and dinner as specified in the itinerary are included in the prices. Please book your flight to arrive at Kilimanjaro International Airport (JRO). Transfer from and to the airport is included. Meru Slopes and Tours will pick you up from the airport. Meru Slopes Tours and Safaris is a licensed organizer for safaris and mountain climbing. They offer a variety of safaris to many destinations.